Almost DNF’d, but I read on to discover what can happen when a girl takes to the Road!! This is a hard book to review, and I almost DNF’d more than once as the beginning is slow and painful. This is a darker view of the world than that in Seraphina and Shadow Scale. The journey through this dark fantasy is worth the discomfort, though. The beginning feels like a selfish rant skewering religion as the cause of every evil, writhing with pontificating self-righteous saints who blame all sexual sin on the depravity and sensuality of women. It feels overwrought and heavy-handed until you start to feel the pain. The pain of listening and believing anyone who tells you that you’re the one to blame, that you deserve to be the victim. The pain of believing the messages condemning you even as you condemn yourself. The pain of accepting that blame and holding it tightly until it petrifies your soul and ravages your heart. If you’ve read Robin McKinley’s dark fantasy, Deerskin, you’ve felt a similar pain. But here it is verbalized and blamed on the recipient until we feel the same hopelessness that Tess does as she contemplates a future that she destroyed when she was 13. 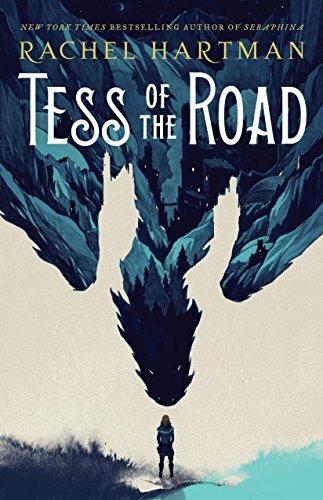 She takes the blame and hammers it into herself, hoping to make amends by keeping herself pure, working to find her sister a husband, and defending her sister’s purity, so her sister will have the future that Tess threw away. Tess strikes out upon the Road with a closed mind. But as her feet eat down the miles, can she find herself and new tomorrows along the Road? There are dangers on the Road: brigands, earthquakes, quigutls, giant serpents, pirates, and hunger. Along the journey, Tess will learn about burdens: those we accept, those we hang onto, and those that we grow beyond. Heads up for adult themes, some sexual violence, and general fooling around, all in the context of a dark fantasy about the human condition and growing beyond the boundaries that define and constrict us.